Melt the butter in a frying pan. Add the onion and sauté for 2 minutes or until light brown and transparent. Add the chillies, corn kernels, epazote and huitlacoche with its juice. Cook over medium heat, stirring constantly until the filling comes together and is not too wet. Finely, purée the chillies in a blender with the milk. Melt the butter, at a medium heat, in a saucepan. Add the flour to the pan and cook, stirring constantly until it is lightly browned. Remove from the heat and continue to stir while adding the chile purée, cream and salt. Try to avoid forming lumps of flour. Return to low heat and stir constantly until the sauce begins to boil and thicken. Set aside. On a medium heated, non-stick, dry pan, heat the wheat tortillas 30 seconds per side to make them soft and pliable. Place a tablespoon-full of the filling on each tortilla and roll tightly. 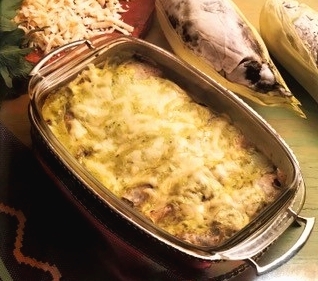 Arrange in a single layer in a greased ovenproof dish. Cover with aluminum foil and set aside until 15 minutes before serving. Pour the sauce over the filled tortillas and sprinkle with the cheese. Bake for about 10 minutes until the sauce bubbles and the cheese is slightly golden.